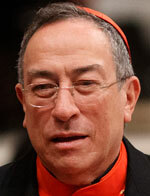 VATICAN CITY (CNS) — Honduran Cardinal Oscar Rodriguez Maradiaga of Tegucigalpa, 70, is a personal ambassador of the Catholic Church’s emergency relief and development aid and probably the best-known Latin American member of the College of Cardinals. In May 2011, he was elected to a second four-year term as president of Caritas Internationalis, the Vatican-based umbrella organization for national Catholic charities around the globe. Under his presidency, he has worked with Vatican officials and Caritas leaders to implement new rules requested by Pope Benedict XVI to strengthen the agencies’ Catholic identity and their ties to their local bishops. A longtime teacher and professor, Cardinal Rodriguez Maradiaga has a combination of education, charm, outspokenness and international experience that make him popular, especially with Latin American Catholics, who make up more than 40 percent of the world’s Catholic population. Cardinal Rodriguez speaks seven languages, is at ease with the media, is an accomplished musician often ready to play the piano or saxophone in public, and can even fly a plane, although he entered the Salesian seminary before he could get a pilot’s license. But as Catholic leaders became more aware of the abuse crisis and the church worked to strengthen its rules for dealing with accusations, Cardinal Rodriguez Maradiaga’s stance also evolved. Though he would never claim he was a serious candidate for the papacy, the cardinal did say in 2002 that a pope from Latin America would bring the culture’s innate sense of hope to the universal church and would be a blessing to the people of the continent. The cardinal’s fight against poverty has been waged on several levels: battling for better education for the poor, criticizing corruption in Honduras and throughout the region, and leading the crusade for the alleviation of the heavy foreign debt of the world’s poorest nations. Cardinal Rodriguez Maradiaga is a frequent visitor to the United States, and as head of the Latin American bishops’ council, CELAM, in the 1990s he worked with North American church leaders to help forge a new partnership within the Americas. At that time, he often spoke against U.S. deportation of Central Americans. The cardinal also has intervened in national issues in Honduras, calling political leaders to accountability and often acting as a mediator to calm tensions in moments of political confrontation. But a statement by the Honduran bishops, which he read on television, during a political crisis in 2009 led to him being accused of supporting a coup. He and the bishops insisted their statement did not take political sides, but was an attempt to convince people to allow the country’s laws to work. As head of the Tegucigalpa Archdiocese, Cardinal Rodriguez transformed many aspects of its work, particularly by facilitating community- and parish-based initiatives. In a 2001 interview with an Italian magazine, the cardinal said: “In my country, Honduras, the church is lay. This may scandalize,” but with more than 14,500 Catholics for every priest and villages spread out over rough terrain, the church has trained and deployed thousands of lay “delegates of the word,” who evangelize, catechize, lead Sunday liturgies and distribute Communion. Oscar Rodriguez Maradiaga was born in Tegucigalpa Dec. 29, 1942, entered the Salesians at age 19 and was ordained in Guatemala City June 28, 1970. In addition to degrees in philosophy and in moral theology, he holds a degree in education with specializations in physics, mathematics, natural sciences and chemistry. He also studied music and music composition in El Salvador, Guatemala and the United States. From 1963 to 1978 he worked in various teaching posts in Salesian institutes in Guatemala, El Salvador and Honduras, covering various combinations of math, science, music and theology. From 1974 to 1976 he served as secretary of the theological faculty of Francisco Marroquin University in Guatemala, where he was academic rector, 1975-78. On Oct. 28, 1978, he was named auxiliary bishop of Tegucigalpa, and in 1993 he was elevated to archbishop. He was general secretary of CELAM, 1987-91, and president, 1995-99.